and thy( your.singular ) house( family )." With strong foundations in the Lord during these 27years of belief, seeking, & research on God's Word and Truth, I was being led to compile the below files. 7th day (Weekend Rest) Man 6000yr Christ 1000yr --- Compressed ver. The 2000+40year Work of God the Father & of the Son & of the HolySpirit. 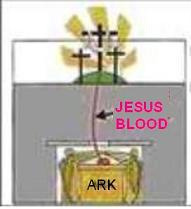 Jesus' Perfect Blood anointed the Ark of Covenant inside Zedekiah's cave, under the place Golgotha(Skull). Matthew:27:33: "And when they were come unto a place called Golgotha, that is to say, a place of a skull," Mark:15:22: "And they bring him unto the place Golgotha, which is, being interpreted, The place of a skull." John:19:17: "And he bearing his cross went forth into a place called the place of a skull, which is called in the Hebrew Golgotha:"